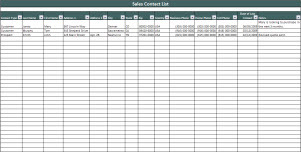 Our FREE Sales Contact List spreadsheet can be used to record your customers and/or prospects. The spreadsheet allows you to document addresses, phone numbers, date of last contact, notes, etc. You can sort your contacts by last name, contact type (customer / prospect,) date of last contact, etc. This spreadsheet will help you organize and better your business relationships. In addition, if you need to send out a mass mailing, you can use this spreadsheet with Microsoft Word to create mailing labels. See our Mailing Labels document for additional information.